Oslo, Norway – Norwegian ski racing powerhouse Aksel Lund Svindal says that a nagging knee injury may well spell the end of his World Cup season before it even starts, and possibly even his career. Svindal’s was leading the overall World Cup chase last January when he injured his right knee in a crash during the famed annual Hahnenkamm downhill in Kitzbuehel. Now, the 33-year-old has told Norwegian broadcaster NRK that the damage is more extensive than he’s been letting on. 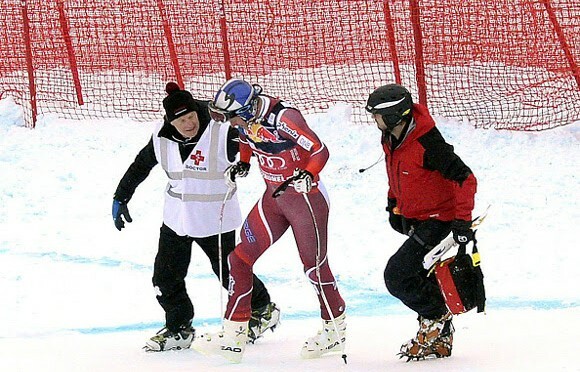 Not only did the crash tear the anterior cruciate ligament (ACL) in his knee, it also damaged the meniscus and cartilage in the joint, Svindal said. In fact, that surgery took place the same day as the crash. Despite the damage, Svindal has been training on pre-season snow Italy’s Stelvio region — his first time on skis since January — and in Chile. But he also admitted to being apprehensive, concerned that the damage in his knee may be too much for his career to overcome. National team doctor Marc Strauss estimates that there’s a 70 percent chance of Svindal returning to World Cup form from a normal knee injury, and even less with the additional damage that Svindal incurred. He said that shifting bones in the athlete’s lower leg during the crash caused what he termed a crushing pressure injury.